Artist Jesse Acosta showcased his art at Bazaar last June. On Saturday, 76 visual artists, crafts makers, clothing designers and other local creative types will come together to sell their wares in the streets of downtown Spokane. Some of them may never have exchanged their work for money, but that's sort of the point of Bazaar, because there's a good chance their buyers won't have much experience purchasing original pieces of art, either. The one-day art fair has an organic feel to it. The art hangs on wood pallets. Street performers wander through the mix of young and old art patrons looking for everything from a T-shirt silk-screened right in front of them to a new painting for their home. In a way, the event itself — the participants in which are selected by an independent jury — is an apt example of the ethos behind the nonprofit arts organization, Terrain, that produces the show. 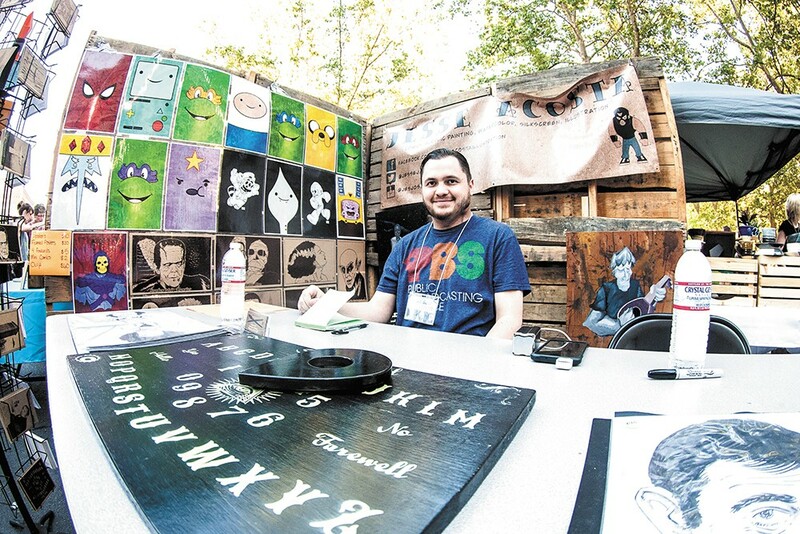 "There's 76 artists this year, and this one is more geared toward letting them get the idea of what it's like to sell their art, so they can get their foot in the door," says Terrain organizer Diego Sanchez. Terrain charges $100 per vendor — much less than most other regional art fairs or markets — and provides wood pallets on which to hang art or other wares. They also don't take a commission of sales, relying instead on cash and in-kind sponsorships to help prop up the event. "We want to help [the artists] figure out how to treat the art as a business," says Terrain co-founder Luke Baumgarten of Bazaar. Terrain, which began as a one-night arts show and live music event in the fall, has expanded into a 501(c)(3) nonprofit with its own permanent event space and a soon-to-open art gallery in the Washington Cracker Co. Building. The group is just three months removed from collaborating with the Spokane Symphony and a number of local artists, musicians and writers to produce Uncharted Territory, and is in a state of flux. But it's a very good state of flux. Last week, Terrain co-founder Ginger Ewing accepted a $100,000 grant from the Washington Women's Foundation, making Terrain the first Spokane-area group to ever win a grant from the organization. "There is no doubt in my mind, sometime down the road, when more of our story has been written, Terrain will look back at this evening, and recognize it as the moment we became something greater," Ewing told the audience at the ceremony in Seattle when she accepted the grant. The grant, delivered over the course of three years, will help Terrain realize its goal of influencing the arts in the region through more programming, and also provides the previously all-volunteer group with the ability to add its first paid employee. "With all the volunteers and the thousands of people who've come through and bought a beer or bought a piece of art — we realize there's been a lot of selflessness from a lot of people. It makes this gift feel like it's for the whole community, because people take so much ownership in [Terrain]," says Baumgarten of the grant. As the organizers put it, there's an educational aspect to Terrain. At Bazaar, which last year saw more than $60,000 in sales by the end of the day, that comes for just about everyone who attends, as Terrain tries to show that buying art helps a community as a whole. There's also some inspiration to be found from the "emerging artists," as the Terrain team refers to the many people who participate in an event like Bazaar. As Terrain builds toward something even greater, it's clear they take some inspiration from these folks, too.